Hearing that so many students do not have enough food at home and are provided most of their meals at school was a big shock to our group. That observation made it evident which topic we wanted to focus on: food. By incorporating nutrition, we taught the students to make balanced meals that they could eat and they learned what foods had positive nutritional value. The hands on nature of the activity and the reward of getting to eat what they made truly motivated the students and kept their focus. 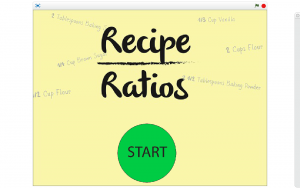 As a result, our team decided to continue to focus on food as our main topic, and we decided that the best integration would be with fraction operations. 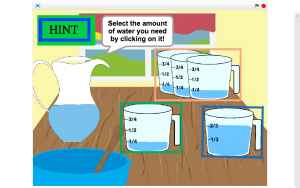 This way, the students could have a connection between math and useful and familiar application. 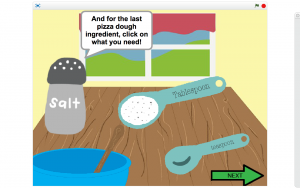 Since then, we have developed a video game that incorporates fractions and recipes together so that it is fun and relatable. 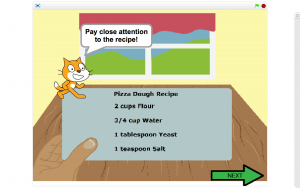 The recipe used for the final game. Example of answer choices. 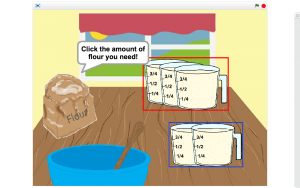 The idea is to help the player memorize the recipe as well as visualize the numbers and fractions. A hint option is given if the players are unable to decide the right answer. 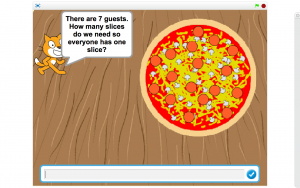 Players have to answer the question given and if they answer correctly, the game will show them the right answer choice. 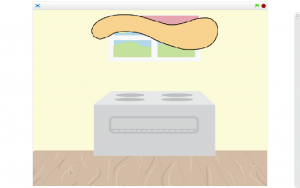 The players would have to click on the next button after selecting the right answer to move forward. This part of the game incorporates player interaction. 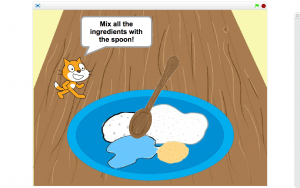 The player have to mix the ingredients with a wooden spoon using the mouse/track pad. This is another physical interaction built into the game. 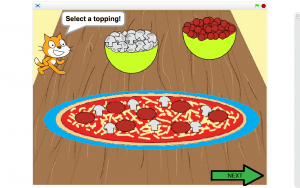 The game enables the player to ‘toss’ the pizza dough by detecting the movements on the computer camera. Pizza is done! 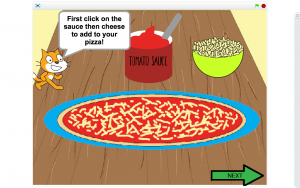 Players can add the tomato sauce and cheese on their own. This part of the game allows customization for the players. They can select either one of the ingredients or both. The last part of the game tests the players comprehension and basic mathematical skills. 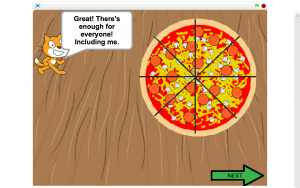 The player is prompted to put in the amount of slices the pizza should be cut into. The is a failure mechanism built into this part of the game. 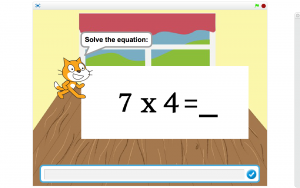 If the player inputted the wrong answer, the scratch cat will tell them whether it is too much or not enough.